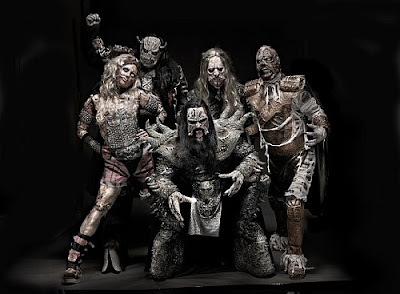 Rock & Metal 4 You: LORDI return with new album "To Beast Or Not To Beast" and tour! LORDI return with new album "To Beast Or Not To Beast" and tour! The monster rockers of LORDI had a really tough year. First, their drummer died and then the keyboardist left the band also. So Lordi had to replace two musicians - and they did. The new members are Mana (drums) and Hella (keyboard) - just have a look at the picture below. On March 8, 2013 the five monsters will return with their new album "To Beast Or Not To Beast". Lordi will also hit the road in spring 2013. Be prepared for a really monstrous show!